Last fortnight bond yields globally dropped to the low end of recent ranges and reached new record low levels in Australia, driven by a growing consensus view of slowing economic growth and lower interest rates going forward. While there is much uncertainty as to whether this scenario actually materialises, the collapse in bond yields raises more immediate issues for portfolio construction today. Such low bond yields raise legitimate questions about whether bond holders are being adequately compensated for interest rate risk, and whether bonds can continue to play their widely assumed defensive role as part of broader investment portfolios. Tackling risk compensation first, the interest rate risk inherent in bonds – known as duration risk – stems from the fact that a bond buyer makes a payment today in exchange for a series of future interest payments. At the time of purchase, the price of the bond will reflect the present value of that future stream of payments, which are fixed in advance. However, the next day if the general level of interest rates (or bond yields) in the market rises, that fixed stream of interest payments is no longer as valuable, as it is now below current market rates. Therefore the bond would need to be discounted to attract new buyers, and the bond price drops accordingly. The longer dated the bond (i.e. longer duration), the more future interest payments need to be discounted and therefore the more pronounced this effect. Hence, longer duration bonds carry more interest rate risk. Meanwhile, the yield (or income) that a bond provides can be thought of as the compensation a bond holder gets in return for taking this risk and as interest rates / bond yields globally have declined since the 2008 financial crisis (GFC), this compensation has substantially declined as well. As an example, the chart below compares the yield vs. duration risk of a widely used benchmark index of AU government bonds (Bloomberg AusBond Govt. Index). The bond index duration has been increasing, while the yield has now declined to record low levels, leaving investors facing more risk for less return. Another way to understand this dynamic is to calculate the amount of return a bond investor receives per unit of duration risk. While this calculation doesn’t account for nuances like roll-down, it still shows the worsening risk vs. return trade off from taking duration exposure. This calculation is provided in the chart below (the green bars) for the AusBond Govt. Index, together with the average yield of the index in each calendar year. At current levels, a bond investor is getting a yield of just 1.78%, which is about what a cash deposit pays, in return for taking a lot more interest rate risk (c. 6 years’ worth of duration risk). As a result, the yield per unit of duration is approaching zero. While there is legitimate debate about whether bond yields will keep falling, as they have been so far this year or revert to rising, causing capital losses for govt. bond as they did for much of last year, it’s hard to argue that bonds are currently cheap. As show in the charts above, the trade-off between the yield you earn and the interest rate duration risk you’re exposed to is currently very poor. If you want to get technical, you can use a metric like the term premium, which is a more nuanced measure of risk compensation. It calculates the risk premium that bond investors receive for holding bonds with duration risk, independent of expectations about the future direction of rates. The catch is that the term premium can’t be directly observed. It is calculated as a ‘residual’ … basically the left over bit that explains the difference between actual observed yields and that predicted from the expected path of future rates. 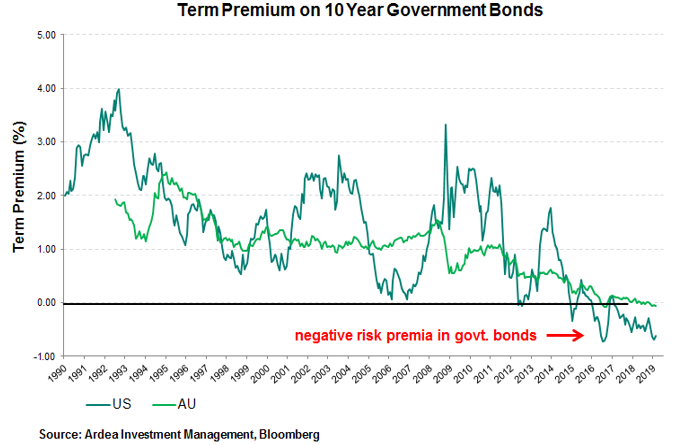 The most widely cited measure of the US term premium was developed by economists at the New York Federal Reserve and is shown in the chart below, together with a similar measure for the AU yield curve produced by the Australian Office of Financial Management (AOFM). 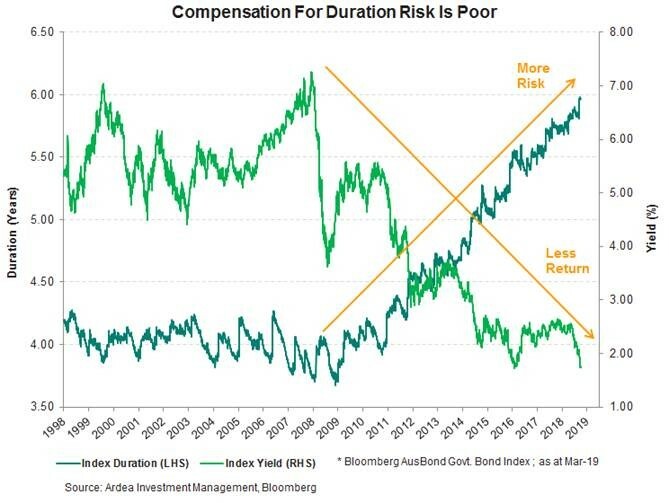 By this measure, the risk premium for exposure to duration is actually negative, so investors are not being compensated at all for taking this risk. While there is debate around technical nuances in measuring term premia – for example, how to account for large scale central bank buying of govt. bonds – the trend is clear, and importantly, the term premium has collapsed at a time when the absolute level of yields is already very low. This combination of record low yields and rising interest rate risk has left conventional government bond investments facing an asymmetrically poor risk of capital losses from rising interest rates, with very little compensation in return, making them very expensive to hold. Why would a rational investor be willing to accept this? One reason would be a strong view that rates won’t rise materially in future. But even then, the investor is not getting paid much to make that bet. Another is for portfolio protection or defensive risk diversification purposes … somewhat like an insurance policy. Conventional portfolio construction assumes that governments bonds will diversify equity risk. The idea is that when equities fall, bond yields decline, resulting in capital gains on bonds that help offset equity losses. The assumption is that bonds are inherently defensive and will be negatively correlated to equities i.e. they will do well when equities do badly. 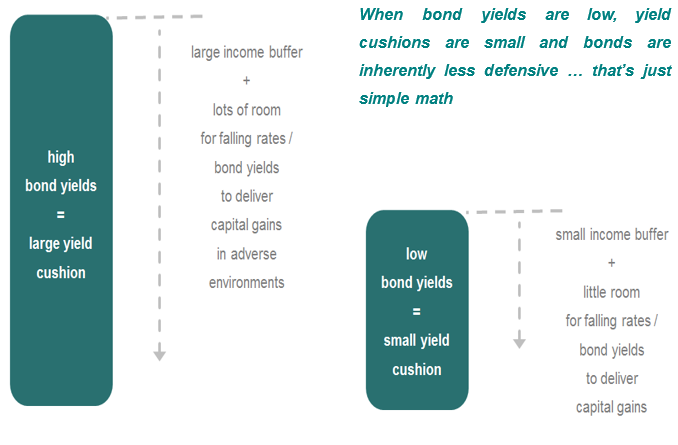 The ‘yield cushion’ is a key determinant of how well this assumption holds. The stable income provided by bonds, together with the possibility of falling rates / bond yields delivering additional capital gains in adverse market environments combine to form the ‘yield cushion’. This is what gives bonds their defensive characteristics. As an example, heading into the GFC the RBA cash rate and AU govt. bond yields were a lot higher than they are now. Back then bonds were providing a decent income buffer and there was lots of room for interest rates / bond yields to fall and deliver capital gains when the crisis hit. Over the GFC period, the RBA cut rates from a peak of 7.25% in June 2008 to 3.0% by September 2009 and 10 year AU govt. bond yields dropped from 6.8% to 3.9%, delivering large capital gains. 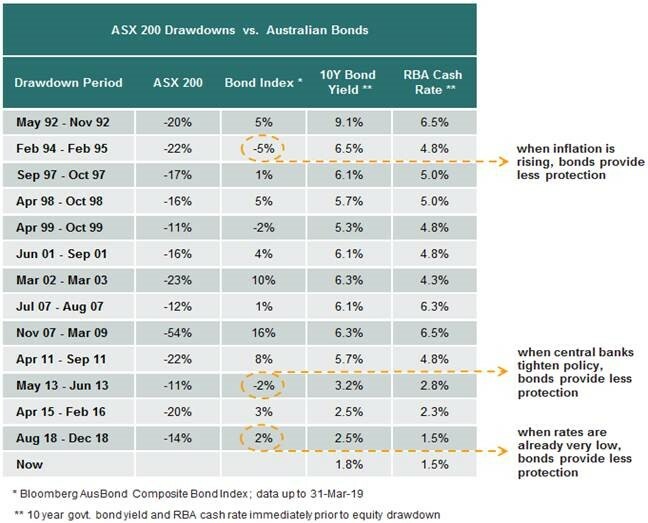 As shown in the table below, the AusBond Govt. Index delivered a gain of 15%, to help offset the ASX 200’s 61% GFC drawdown … that was the yield cushion in action. Now, the RBA cash rate is already down at 1.5% and 10 year bonds yielding around 1.8% are at record low levels. 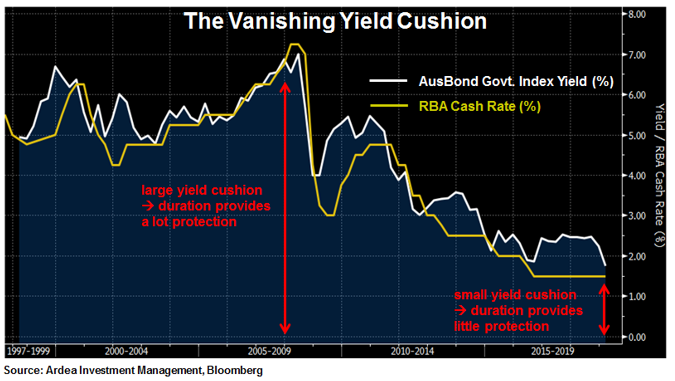 The yield cushion in AU bonds is now very small, so there is simply less room for bonds to keep delivering the same buffer against equity losses going forward. 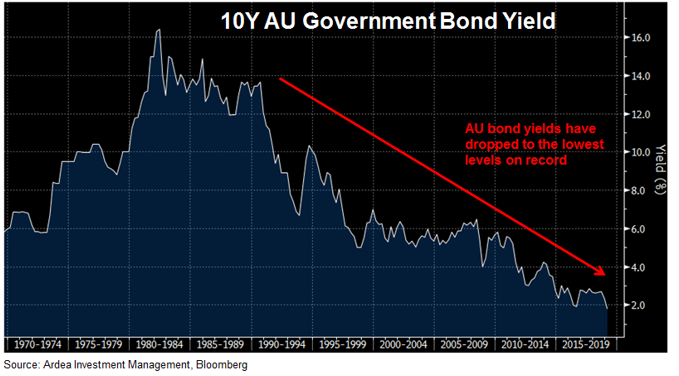 The chart below highlights just how small the yield cushion in AU bonds has become. 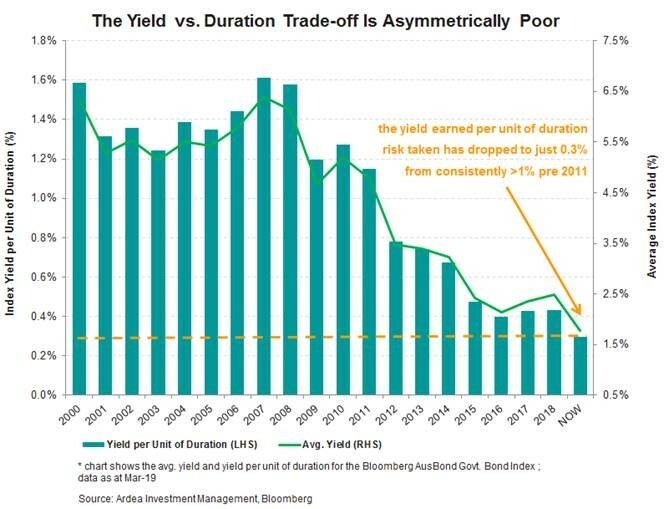 Not only is compensation for duration risk very poor, as explained earlier, but the vanishing yield cushion also means that duration exposure simply can’t provide the same protection it used to. Combing these facts, the implicit cost of holding duration as a form of defensive risk diversification or portfolio protection is currently very high. Small yield cushions make the implicit cost of holding duration for portfolio protection very high. Tying all this together, if you view the duration exposure in conventional govt. bond investments as a form of portfolio insurance, the implication for portfolio construction is clear. While duration can help protect your portfolio against a large equity market sell-off, it is currently a very expensive insurance policy, which no longer pays out as much when it does work, and in some scenarios may not pay out all when you need it most. Therefore, being overly reliant on duration for portfolio diversification and downside protection is now far from optimal. Fortunately there are alternative forms of portfolio protection that can complement conventional duration exposure by providing reliable downside protection and defensive risk diversification, but without the interest rate risk. Stay up to date with the latest news from Ardea by hitting the 'follow' button below and you'll be notified every time I post a wire. Want to learn more about Ardea's expertise? Hit the 'contact' button to get in touch with us or visit our website for further information. As long term rates decline to 0%, or even negative rates, as per Japan and Germany, capital gains on bonds can still be significant although the AUD probably won't be doing so well unless the USD also goes negative. In which case, hard assets look more and more attractive. Thankyou for the informative article, re-enforced my actions, for our super fund.